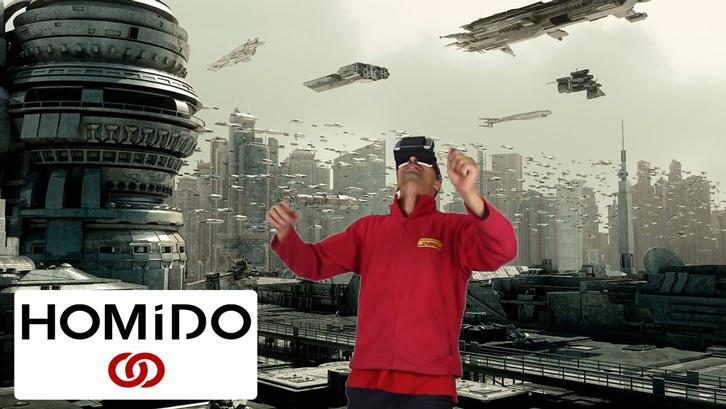 Rate this Article The Homido VR headset is a mobile smartphone 3D viewer which delivers a strong solid performance as far as mobile 3D applications go. Read on to learn more. The increasing popularity of 3D games for mobile devices especially smartphones have given way to the need for compact viewing devices that would enhance the gaming experience and somehow eliminate the need of using ones hands. Games like Outbreak 3d, Lavirinthos or F18 3D Fighter Jet Simulator which run on smartphones would be fully enjoyed if used with these 3D viewers. The Homido VR headset is a mobile smartphone 3D viewer which delivers a strong solid performance as far as mobile 3D applications go. However, it would not be feasible to compare current mobile headsets to VR devices such as the Oculus Rift and Sony VR used for gaming pc’s and consoles respectively. The driving factor behind the Homido VR headset would be the advantage (though not perfect) of its ergonomic user design and the option for the 3D lenses. The headset gives a choice of 3 different lenses for normal, farsighted and nearsighted users. Unfortunately, unlike most of the pc and console headsets, the Homido isn’t designed to be used with glasses. It’s just too small to fit them. These lenses are of high quality and are fixed onto rubber placeholders which are stuck into the designated holes of the headset. They are easily removable for cleaning or swapping with an alternative lens appropriate for your vision. These lenses provide the user with a 100-degree FOV (field of view). The casing (which you strap to your face) is very sturdy and made of high-quality lightweight plastic. It uses a couple of elastically adjustable straps for the back of the head and top. This method balances the weight of the unit and makes it much lighter to use. The unit comes pre-assembled, ready to use and rugged enough to be packed in a suitcase or bag without being disfigured should you bring it with you when you travel. The Homido VR works by inserting or slotting your smart phone downward into the front panel of the faceplate. Ventilation holes have been provided on the unit to dissipate the heat coming from the phones specially when running 3d applications. Two rotating knobs at both sides of the headset are used to adjust the depth of view and the distance between your pupils which helps eliminate blur and distortion. However, the lenses have this slight fishbowl effect not to mention that it is difficult to align the left and right side of the screen to the headset by positioning your phone at the absolute middle. Though the headset will work with almost any smartphone you slot into it, it is recommended that one use a mobile unit with a 5 inch screen and a resolution of 1080p. Also, though the face cushion is of high quality, it is recommended not to strap it in too tightly. Depending on the features of ones face, there is a tendency for the visor to exert pressure around the nose area which might be uncomfortable for some. The lighter the phone the better, as it will definitely add weight to the overall unit that causes the nose cushion to painfully dig in. As mentioned, one cannot compare the 3d quality of the Homido VR to the higher end headsets designed for console or pc use. 3d quality will depend on the ability of the phone to run VR apps, so using high-end smartphones is highly recommended for best experience. Another thing worth mentioning is that some phone apps may be a little difficult to run with the headset. Unlike movement controlled VR games which free the use of hands, most video players still use touch-screen control. Removing the phone to set the controls and sliding it back into the visor will take an amount of effort plus adjusting the phone to the middle position once again. This ruins the immersive experience of VR from the very beginning. Also, playing games requiring the use of the phone’s keypad would likely be out of the question. A Bluetooth remote gamepad would be the best option but one will have to spend a little extra just for that. 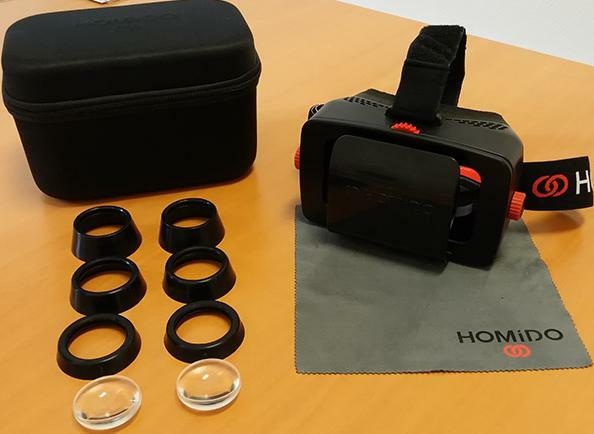 The Homido VR headset comes with a paired Homido Center App downloadable from GooglePlay. It contains a selection of the best available VR apps updated weekly. 3D apps, photos, videos and those that have the 360-degree feature can be divided by category or filtered out by application, rating and price. A launcher keeps all of your stored VR apps in one folder. As the Homido Center App was released way before the actual Homido VR headset, some of the applications retain their compatibility with other VR Headset devices like the app that splits the screen into left and right. Goggle Cardboard was one of the devices that can be used compatibly with Homido’s own early apps. With Homido VR priced at $80.00 for the entire VR kit (smartphone excluded) and an extra cost of around $25.00 for the Bluetooth remote, Homido Entertainment delivers a refreshing economical alternative to the high end VR systems available today.